Want a great DIY project? 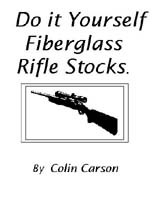 Want a high quality fiberglass stock for the price of a cheap plastic one? Building a Custom Sporter?...Then you need to see this book! I explain how anyone with some basic hobbyist skills and common tools can mold their own fiberglass or fiberglass laminate rifle stocks! Mentioned in Rifle Shooter magazine. These pages are dedicated to the shooting sports hobbyist that would rather build it, reload it and design it himself rather than go out and buy his or her shooting accessories. It focuses on my favorite guns of the moment for me, Sniders, Martini's and of course the FR-8 Mauser! Have a look around and be sure to check out some DIY (do it yourself) projects that will help you enjoy your hobby a little bit more.